Valencia have failed to overturn a controversial decision to disallow a goal in a Champions League Under-19 penalty shootout against Chelsea. The Spanish side protested to Uefa after the referee ruled Alberto Gil's penalty had hit the post when it had in fact rebounded from inside the goal. Valencia boss Gary Neville called it "scandalous" while Chelsea said the ball "clearly crossed the line". 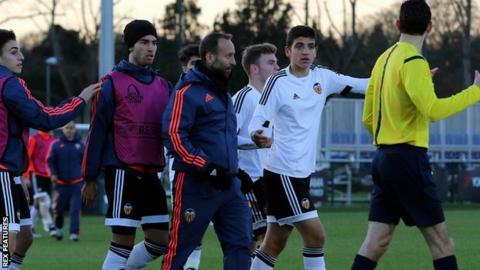 On Monday, Valencia said their appeal had been dismissed. "The club regrets the decision taken by Uefa," said a statement on Valencia's website. "We want to encourage our young players to continue to be motivated and continue believing in fair play." Chelsea scored all five of their penalties to go through after the game finished 1-1 in normal time. The Valencia players and staff urged the referee Adrien Jaccottet to consult the television replay at Chelsea's Cobham training ground. It is believed the Swiss official refused. Reigning champions Chelsea will host Lyon or Ajax in the next round, which is due to be played on 8-9 March.